It’s no secret that Google loves updating its SEO algorithm. In fact, over the course of a year, they may make upwards of 500 changes! But if you get it right, you can reap the benefits of increased traffic, which leads to more conversions, improves lead generation, and boosts sales. And every business wants more traffic, leads and sales, right? SEO ranking factors have changed a lot over the years (find out how in our keyword research guide). Search engine optimization techniques that worked even 5 years ago won’t cut it today. That’s why we’ve pulled together some advice from experts so you can make sure you’re using the best SEO strategy for the coming year. These are great SEO tips and tactics for building big traffic in 2019. As you’ll see, if there’s one theme that unifies them all, it’s creating a better user experience, but some of these experts take their own unique approaches. We’ve also included a bonus section with 16 quick SEO tips that will have you going into 2019 with a bang and not looking back! 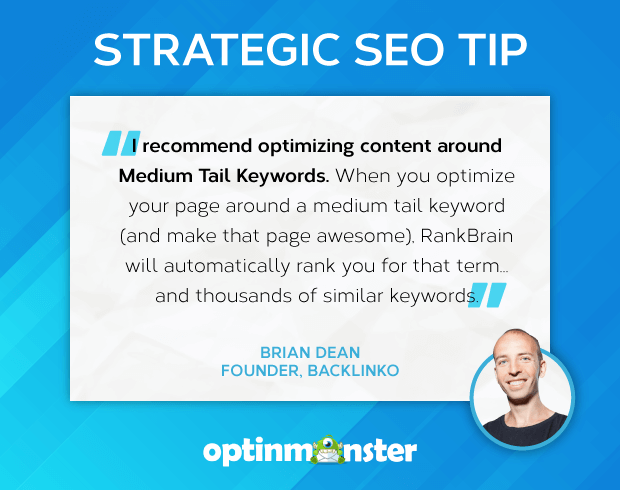 Ready for these awesome SEO tips? Let’s get started. Our first expert is Brian Dean of Backlinko. Brian talks about the importance of user experience signals in search engine ranking. We’ve already heard from Google that RankBrain is their third most important ranking factor, and that trend is not only likely to continue but to become even more important in 2019. If you’re not clear on what RankBrain is, you’re not alone; it sounds like something straight out of science fiction. And, it is a machine learning system that helps Google decide where pages should rank in search results. So, maybe it’s a little sci-fi. To put it more simply, RankBrain watches how users interact with search results and rank the results based on that. If users click on a result and immediately bounce from the site, the site will start to lose ranking. But, if users click on a result and spend time on the site, the site will start to gain ranking (or stay at a higher ranking). All based on the user experience with the site. Dwell Time: how long a visitor stays on your site (over 3 minutes is a good dwell time). Next up, we have Andy Crestodina, co-founder and Chief Marketing Officer of Orbit Media. Andy recommends looking for posts that almost rank high and rewriting them. 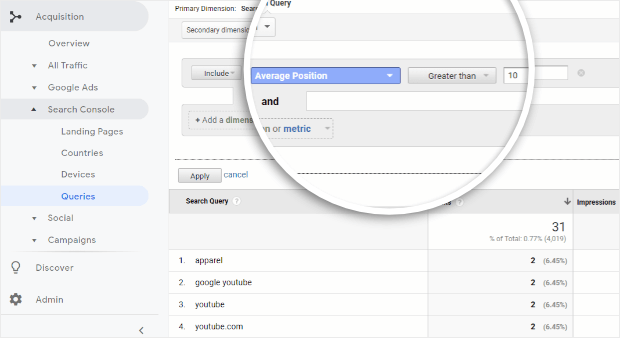 You can find these posts in Google Analytics by going to Acquisition » Search Console » Queries and setting up an advanced filter to show the phrases where your average position (rank) is greater than 10 (on page 2). Now give those articles an overhaul. Add details, examples, answers, statistics, images, contributor quotes, and anything else that makes it a better piece. If you go big on quality, you’re very likely to add length and keyphrase usage naturally. Make it a page that you’re so proud of, you want to print it and frame it on the wall. 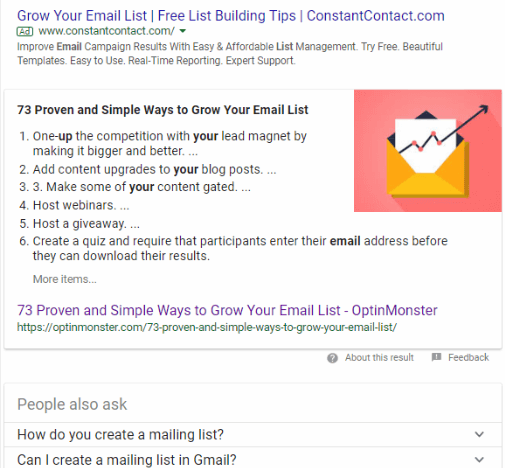 As you rewrite, pay attention to connected subtopics, which are visible on the search results page in the “people also ask” section and in the “related searches” at the bottom of the page. Do this as a regular, quarterly content marketing audit. Video marketing can be a huge traffic source, but some marketers are still ignoring its potential, says Shilpa Shah, co-founder at Hummingbird Web Solutions. Shilpa stresses that one of the best SEO tips is quality over quantity: just because you have a large number of indexed pages doesn’t always mean your site’s going to attract a larger volume of organic traffic. Also, video content has a lot of untapped potential which is great for SEO and makes for good user engagement. Chances are, that your user might quickly run through a 1-minute video but may not have the patience to read your 100-word article. Online video is huge and is only going to get bigger. Cisco is projecting that online video will make up 80% of all online traffic by 2021. 🤯 And, even with all that video out there, 43% of people say that want even MORE video content! Update the title and description on older videos to keep them searchable and relevant. Optimize the video’s audio and video quality, as well as graphics and images. Integrate videos into the rest of your site content. A little more than 11% of search results have a featured snippet. These are the results that show up on search engine results pages typically after the ads but before the ranked results. They’re usually alongside an image, table, or a video, making them stand out even more and putting them in an even better position to steal clicks from even the highest ranked results. Pretty neat, right? Let’s hear from A.J. Gherich and our friends at SEMRush about how to optimize your content to get them. A.J. Gherich, the founder of marketing agency Gherich & Co., teamed up with SEMRush to put together an enormous study of 6.9 million featured snippets made up of over 80 million keywords. Based on their data-driven approach, A.J. 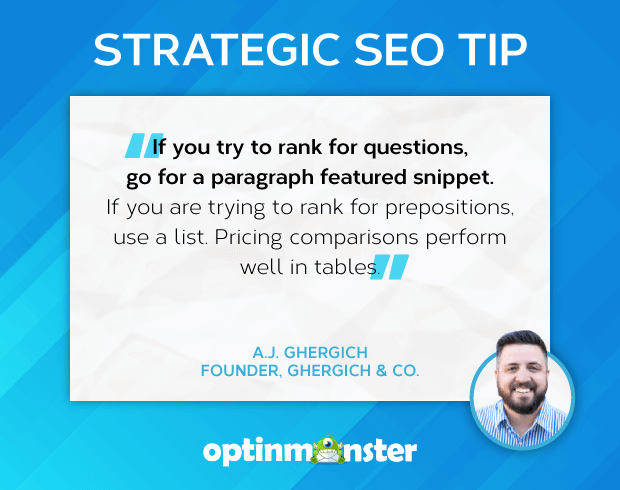 recommends using a paragraph format if you’re trying to rank for question keywords like “how can I grow my email list” or “what is a featured snippet?” However, if you’re trying to rank for a preposition (“for,” “to,” “like,” etc.) a list format would be your best bet. 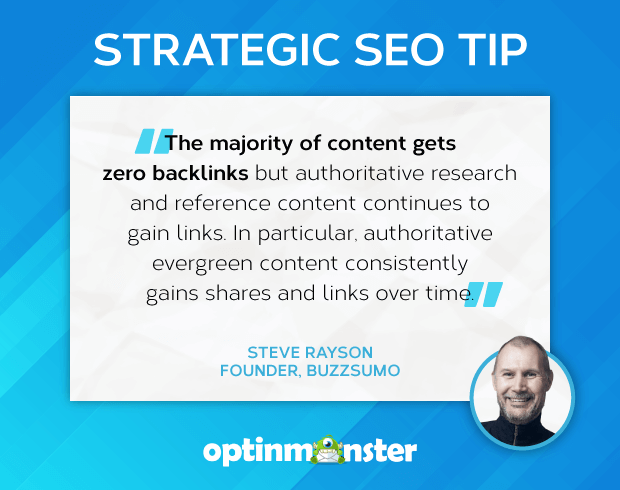 BuzzSumo founder Steve Rayson recommends creating long-form, in-depth posts about a topic to position them as the kind of result Google is looking for: the best possible result for the searcher. In their 2018 Content Trends Report, BuzzSumo analyzed 100 million articles published in 2017 and found out some pretty interesting things about social sharing, viral posts, and the kind of content that has staying power. For starters, in the past 3 years, the social sharing of content has been cut in half. 🤯 This is partly due to content saturation (3 million blog posts are published every day) and partly due to a rise in private sharing (people are sharing content in private messages, not posting on walls). Stick with long-form content. Longer content (at least 2,000 words) tends to outrank shorter content. Use LSI keywords. These are keywords or phrases strongly related to your post’s topic. Max DesMarais is an SEO & PPC Specialist for Vital, a Digital Marketing & PPC agency that specializes in PPC management services. His expert tip is to focus on user engagement. From updating existing posts to creating new ones, pages should be built to maximize engagement. Be easy to read. Content utilizes whitespace, headings, short paragraphs, and relevant images to make the page easier to absorb and increasing the user’s time on the page. Include highly relevant links and offers on the page. Offering relevant internal links that will answer a reader’s question. 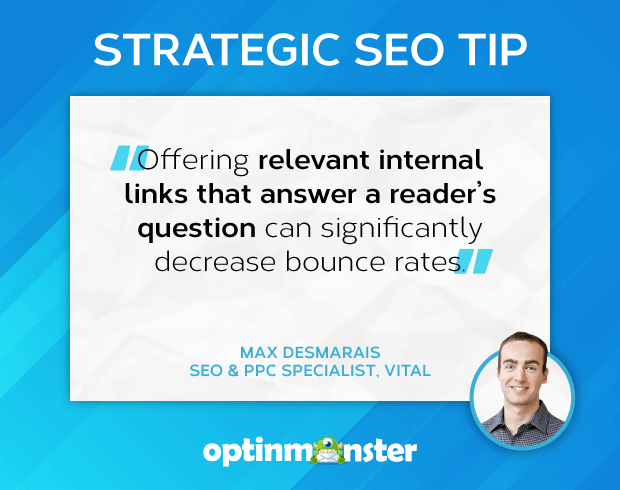 This often can significantly decrease bounce rates, and get users further into your site. Use LSI keywords, and answer additional questions that users may think of after viewing the content. Simply offering only the content that a user searches for is no longer enough. Pages need to supply additional information a user may be seeking. Providing additional information will help retain the user, and tell search engines that the page’s content is not only answering the search query but providing additional value that other pieces of content may not be. Contain multiple ways for users to absorb the content. Include images, infographics, video, and text. This will capture readers’ attention, and keep them more engaged in the content. Employing these tactics will ensure that your pages are highly valuable to the readers, and search engines will mark these pages as high-quality content. Julia McCoy, founder of Express Writers encourages continued efforts to optimize for voice search. Voice search started becoming big SEO news in 2018, and McCoy tells us as voice search technology improves and becomes more accessible, that trend is going to continue. 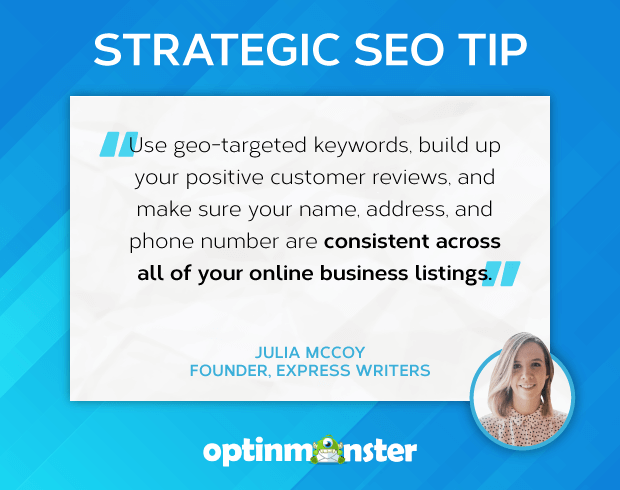 “If it makes sense for your brand, use geo-targeted keywords,” says Julia. This means optimizing for local searches. Since most voice searches are local, this tip is an absolute must if you’re a local business or have a target audience in a specific geographic area. In addition to optimizing for local voice searches, Julia stresses the importance of ranking for both questions and answers. 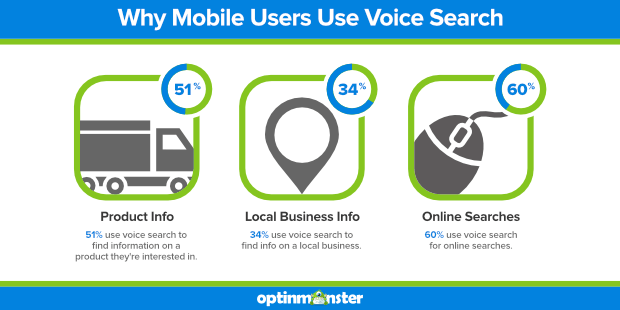 More than half of searchers are using voice search for basic online searches, so creating high-quality, voice search optimized FAQs can go a long way to get your posts ranked. For this tip, we’re going to hear directly from the source: Google. First, what does “mobile-first indexing” even mean? Quite simply, it just means that Google now considers the mobile version of your site to be the primary version of your site. If you don’t have a mobile site, your desktop site will still be used. But, if your site isn’t mobile-friendly your rankings may take a hit; remember that user experience is HUGE. 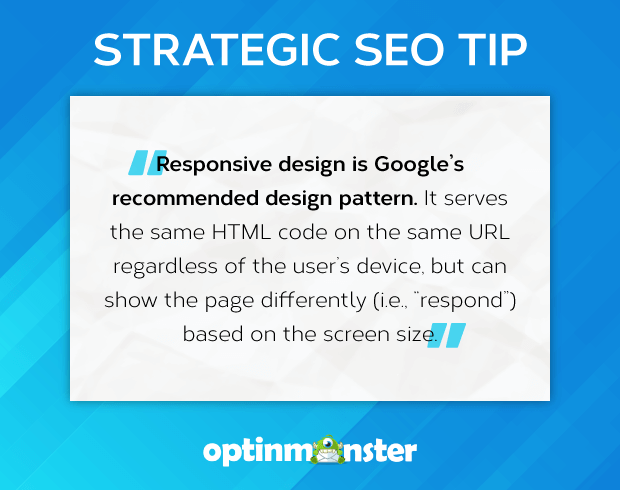 If your mobile site is currently using an “m.” URL, like “m.optinmonster.com,” Google recommends switching over to a fully responsive site. This is because Google currently just annotates m-dot URLs, it doesn’t actually index them. Making the switch to a responsive site means that Google can simply update the annotations to say the responsive site is now mobile-friendly, which saves time. In this bonus section, we’re sharing 16 quick SEO tips that you can easily put into practice to boost your SEO today. 1. Write headlines that appeal to searchers’ emotions. 2. Use power words in your headlines to trigger a response from searchers. 3. Include parentheses or brackets in your titles to draw attention. 4. Write a strong meta description that sets your post apart. 5. Grab visitors’ attention with an above-the-fold hook. 6. Craft engaging intro paragraphs. 7. Use internal linking to keep visitors moving to other relevant content on your own site. 8. Create a custom 404 page (displayed if the requested page isn’t found) to help visitors find what they’re looking for on your site. 9. Link to other sites with high authority and relevant content to encourage relationships (and backlinks). 10. Increase your social proof through reviews and testimonials. 11. Install an SSL certificate and move to HTTPS to inspire confidence in site visitors. 12. If it makes sense for your business, get your site set up on Google My Business to show its legitimacy. 13. Compress and optimize your images to increase your site speed. 14. Use tracking on your site to find out where visitors are dropping. We recommend Google Analytics (and MonsterInsights is a must if you use WordPress). 15. Make sure your site is crawlable by creating an XML sitemap. 16. Use structured data (aka, “schema markup”) to classify your content so Google knows exactly what your post’s about. That’s the end of our roundup on search engine optimization tips and tricks. 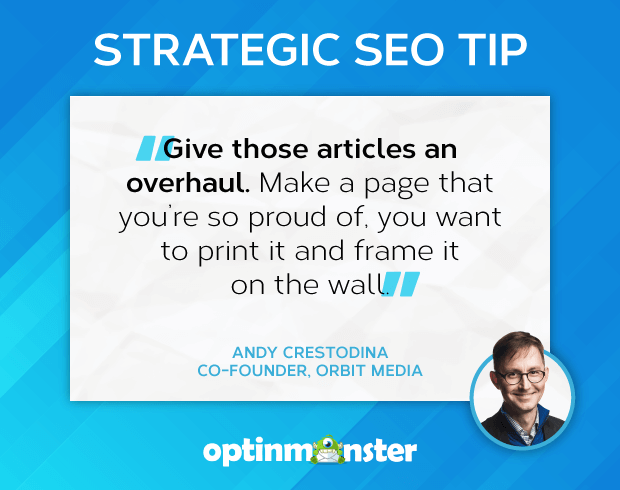 Over to you to put these SEO tips into practice. We recommend starting with our SEO audit guide and then updating your outdated SEO before moving on to these tips. When you’re done, make sure your new strategy is working by checking out our guide to measuring content marketing ROI. And don’t forget to follow us on YouTube, Twitter, and Facebook for more expert roundups and in-depth guides. I have been following Brian Dean for quite some time and his sky scraper technique brought some new changes in the field of SEO, in this article there is valuable information of SEO which will help the beginners and people who are new to seo to understand the real meaning of search engine optimization. Thanks for sharing these significant tips with the community. We’re big Brian Dean fans too. 🙂 Can’t wait to see what comes after the big voice-powered search surge and AI improvements. Exciting times for SEO! Wow, I’ve gone through many blog for SEO tips but your article seems to be much accurate & worth considering. The very first thing I was impressed with was “good user experience”. I honestly believe that our content, web design must be focused on “impressing the users”. As a user point of view, we must imagine how our article would help them solve their problem. I’ve always been thinking about this step (good to see someone else following that as well). Featured snippets is another most important optimization tip that can help us reach more targeted traffic (doesn’t matter on which position we are on Google’s first page). I’m trying to optimize that for my website and hoping to get the results soon enough. Any good white-hat hacks & tips posts from you would be appreciated. We have TONS of killer SEO content on our blog, so definitely check those out. There’s a post specifically about white hat vs. black hat seo that will probably interest you, so I’ve linked that separately. I wanted to let you know that this is real informative and guide for beginners like us! Especially tips like CTR and bounce rate are helpful for me.. I have bookmarked this article and i’m sure i’m gonna implement on my blog NettyFeed. Thanks for sharing the useful content to improve the SEO. It’s absolutely superb. This blog is really informative and has helped me a lot to focus on my SEO needs as well. The tips are good for a small business to get higher rankings in search engines. I will use it as well for my website.